Stripe makes it easy to accept payments via credit or debit card online and is perfect for event ticketing. You will need a Stripe (or PayPal) account to accept payments generated from the sale of your tickets. Your customers will be able to use credit or debit cards. 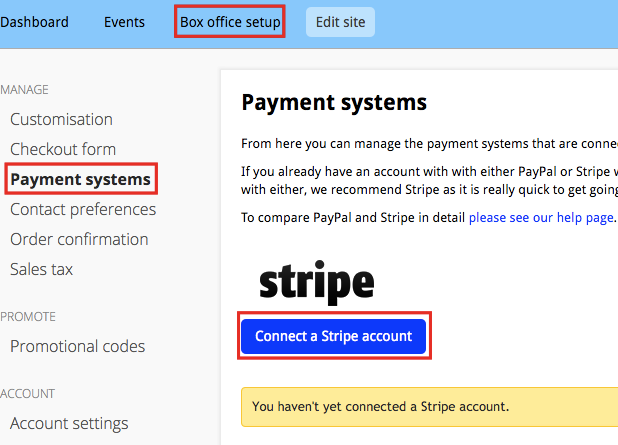 Click ‘Box office setup’ from the main navigation. Click on the blue button that says ‘Connect a Stripe account’. Click on “Sign in” if you already have a Stripe account or complete the form under the initial banner to create a new account. Stripe will now be available as a payment option when you edit any of your events.